Gong hay fat choy! Happy Chinese New Year! And happy Valentine’s Day to you as well! I’ve got a special treat for you today as a present from me to you, with help from Valerie and Beavie over at A Canadian Foodie. 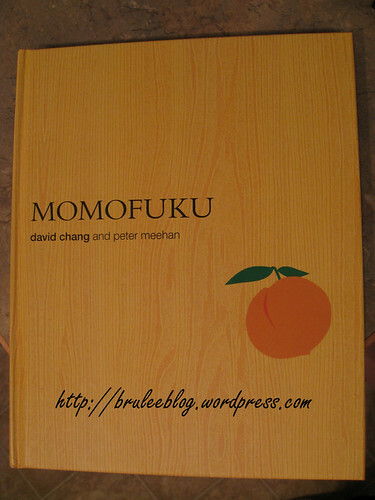 When Valerie found out that I got a copy of the Momofuku cookbook by David Chang and Peter Meehan for Christmas, she had a great idea for us to pick out recipes and do them at the same time in order to compare our experiences. A quick flip through the cookbook told me one thing – David Chang doesn’t do simple recipes. At first glance they may seem simple but this initial impression is deceptive as most of his main recipes comprise of 2+ recipes combined together. Some of them can take days. I had first choice, and I wanted to start with something simple, so I picked fresh oysters with a pickled Asian pear and black pepper mignonette. The book has a fairly detailed section on how to choose, clean and open fresh oysters (pages 131-133). I was already familiar with most of these rules, but I thought one rule was a great reminder for myself: smell the oyster before you serve it and see if it smells clean and fresh and sweet – of the sea but not fishy. 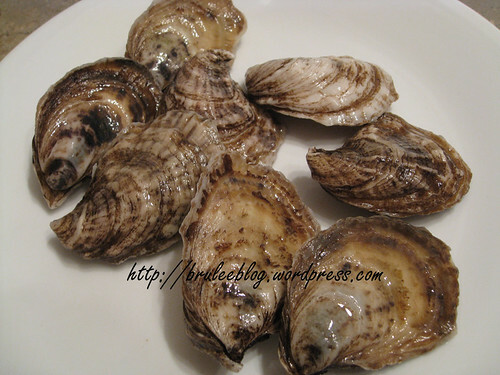 I chose some lovely (but small) Malpeque oysters from Prince Edward Island. I gave them a good scrub under cold water, and kept them in the fridge until I was ready to shuck them.